Of all our family traditions, one of my favorite is our family movie night. 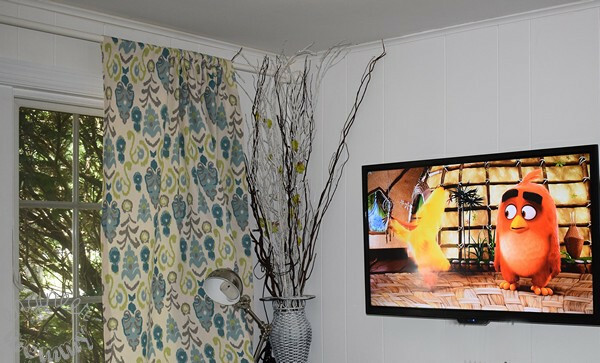 We love to gather around the television and watch a movie together as a group while enjoying great snacks. We recently had a family movie night to enjoy the new release of the Angry Birds movie. 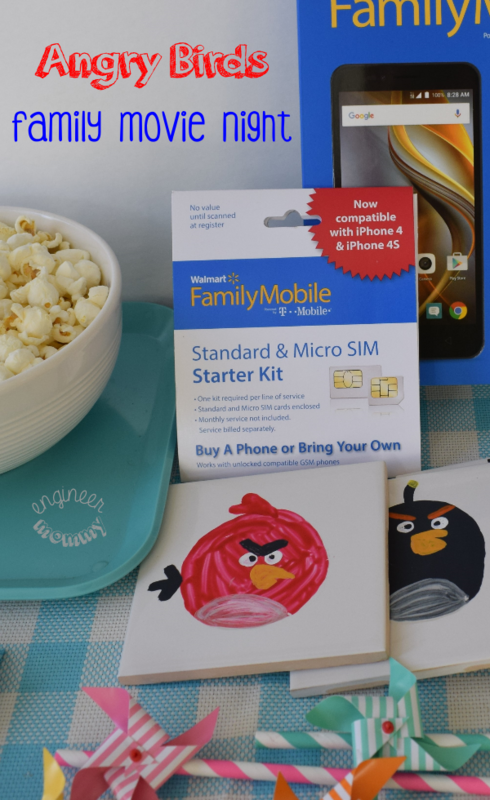 Today, I’m excited to share with you all some fun ideas for having your own Angry Birds movie night. 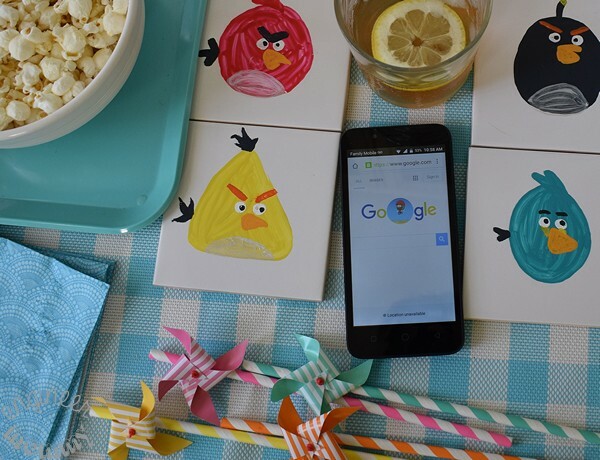 From a printable word search game to DIY Angry Birds coasters, you can create a fun night full of creativity and fun for your family. To research ideas for my movie night, I used my new Coolpad Catalyst smartphone with my Walmart Family Mobile PLUS plan. Here’s a sneak peek at the DIY coasters I made for this movie night! I love my Walmart Family Mobile PLUS plan! Have you ever checked it out? This plan features an Unlimited Talk, Text, & Data which includes up to 10GB of 4G LTE data PLUS a free movie on VUDU. This free movie on VUDU can be a new release rental with a $7 value! This plan is offered at only $49.88 per line. That’s an impressive amount of data at a very affordable price. 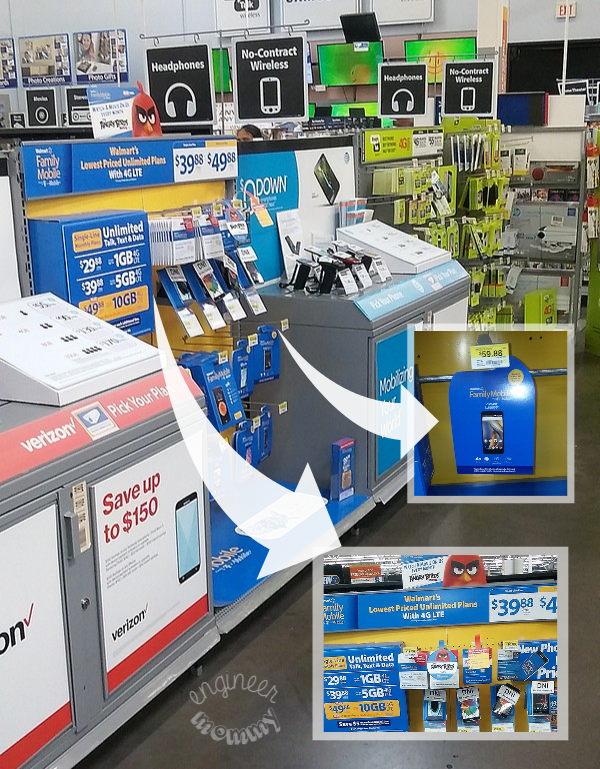 If you’re in the market for a new cellular carrier, be sure to check out the Walmart Family Mobile PLUS plan. 1. Start by drawing the outline of the various bird characters in pencil. Then, using the paintbrush fill in the outlines with the appropriate paint colors. 2. Add additional features to the birds, such as tails and feathers. It doesn’t have to look perfect; the imperfections are what give it a charming look! 3. 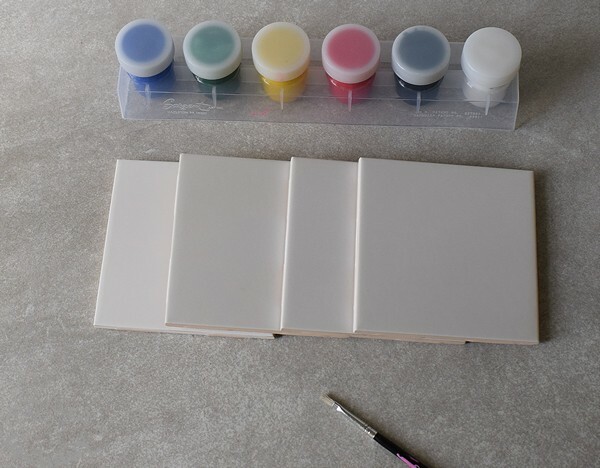 To add the whites of the eyes, use a cotton swab dipped in white paint. To add the pupils of the eyes, use a pencil dipped in black paint. 4. Lastly, add the final touches (beaks, eyebrows, etc.) using the paintbrush and paint. 5. To make the coasters more durable, I sprayed some waterproofing spray on top. 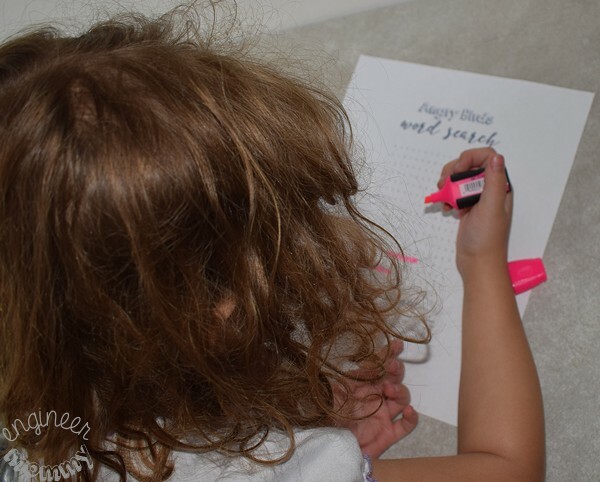 Another thing I created for our Angry Birds Family Movie Night is a Word Search Game. There is a list of some of the characters from the movie at the bottom and you have to find the names within the grid of letters! To download a free printable of this word search game, please click here. Here is my daughter playing this game before our movie started! No movie night is complete without some delicious snacks. 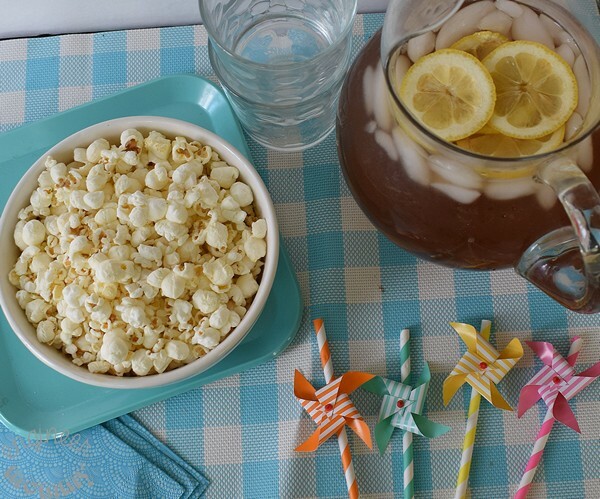 I gathered some delicious popcorn and some lemon iced tea! With the Angry Birds coasters and the Angry Birds Word Search game, our movie night is coming together so beautifully. 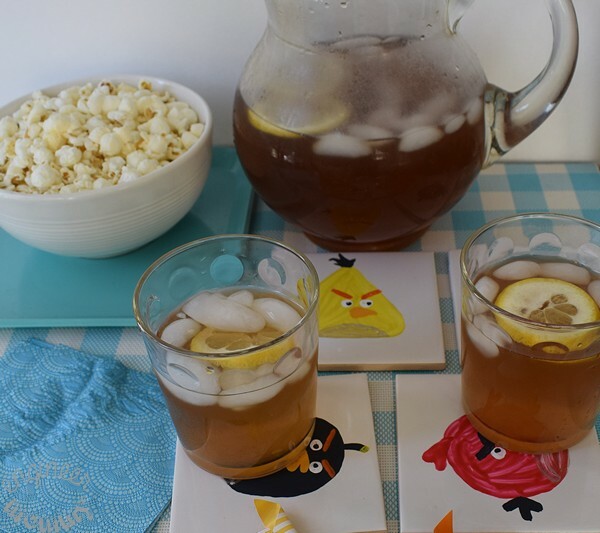 The Angry Birds coasters make the perfect spot to set down a glass of lemon iced tea! My daughters both wanted the Red Bird coaster! We were so excited when we finally sat down to watch the Angry Birds characters on the screen! Did you know that the Walmart Family Mobile PLUS plan offers one free VUDU movie each month ($7 value, same as a new release rental)? That means even more movie nights for us in the future. We love family movie nights, so with this free movie allowance, we can enjoy many more movies together! 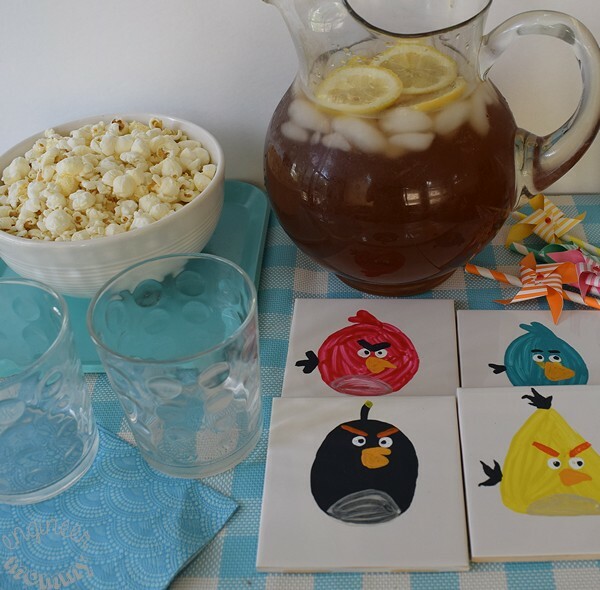 Want even more ideas for your Angry Birds Family Movie Night? 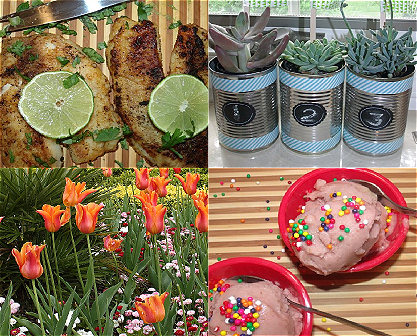 Here are some more fun ways to incorporate the movie into your evening! Serving chips? Call them “Chuck’s Chips” after the character in the movie. Serving soda? Call it “Stella’s Soda”. Little details like this make the evening more magical for the kids. 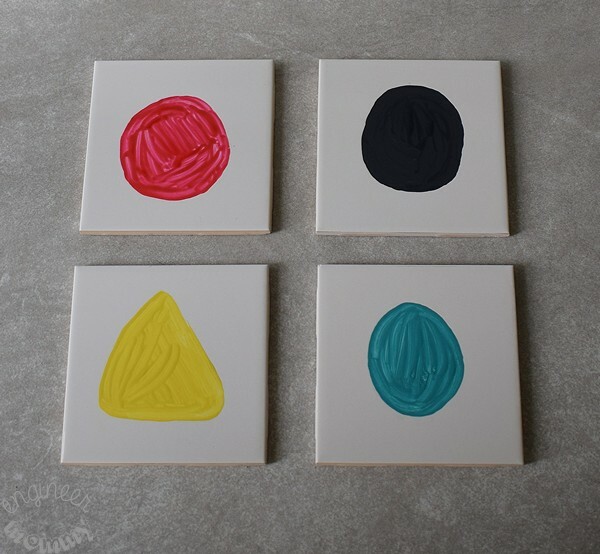 Draw a few of the movie characters onto small canvases (in the same simple way we made the coasters). 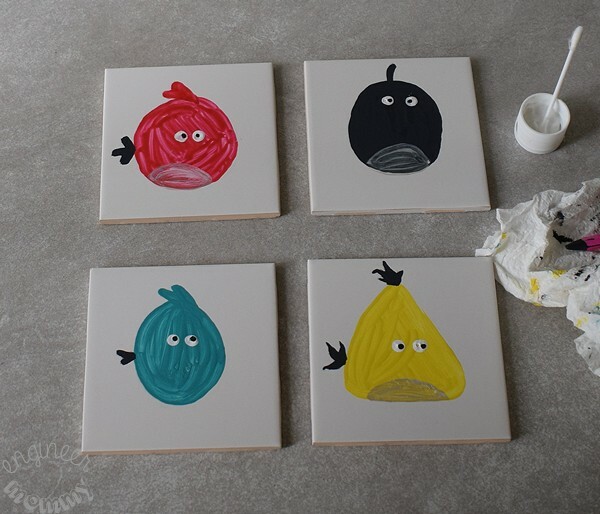 Place these around the room to add more Angry Birds to the space. Encourage everyone to play the Angry Birds game app before the movie. The person with the highest score wins! To prepare for my movie night, I researched some recipes & craft ideas online using my new smartphone: the Coolpad Catalyst from Walmart for only $59.88. With the Walmart Family Mobile PLUS plan, I get Unlimited Talk, Text, & Data which includes up to 10GB of 4G LTE plus a free movie on VUDU every month ($7 value) per line for $49.88. I can watch my free VUDU Movie on a SmartTV or on a regular TV via Roku, Chromecast, or other compatible streaming media player. *All prices for phones and plans included in this post are accurate as of the date of posting; however, these prices are subject to change. Please refer here or your local Walmart for current pricing. To get my plan all set up, I needed to buy the Starter Kit from Walmart. By the way, there’s a great deal going on right now! For the first time ever, the Starter Kit will be on rollback for $19.88 (from $25)! I love that I was able to get my phone set up so much more affordably at Walmart than at other carriers. 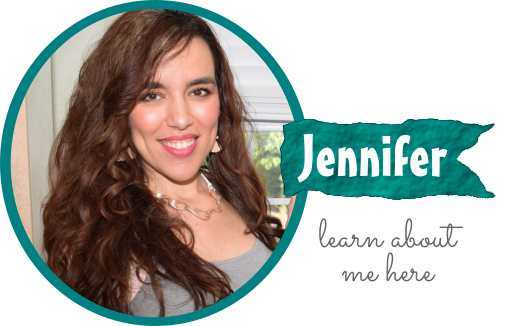 I use my phone every day to check my email, respond to blog comments, post on social media, keep in touch with friends/family, and so much more! With a large data allowance of 10GB of 4G LTE data, I don’t have to worry about running out of data. Since the Coolpad Catalyst has a 5MP rear camera, a 2MP front camera, a 5″ display and 8GB ROM, it’s loaded with all the features I look for in a fast and powerful phone. As a full-time blogger, I never leave home without my phone. 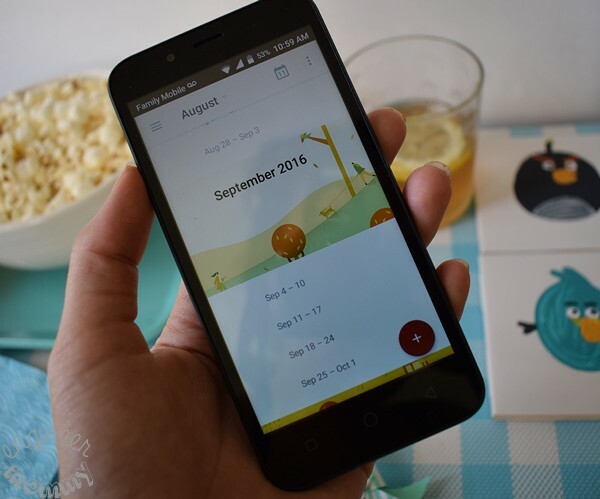 Keeping my calendar updated on my phone makes it very easy to keep track of my daily chores and responsibilities. 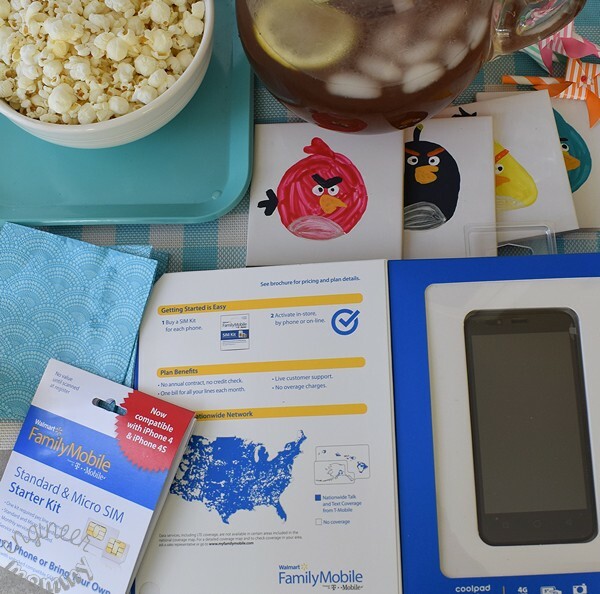 Want to check out the Walmart Family Mobile PLUS plan for yourself? Visit your local Walmart store and look for the Angry Birds signs! You can even meet with a Walmart Family Mobile rep. CLick here to find an in-store event near you. You can even find a code at these events that when scanned, will give you a free power up for the Endless Runner Game on the Angry Birds Action! app. Plus, if you scan the Angry Birds code on the Angry Birds displays, you can unlock a selfie augmented reality experience with the Hatchlings. 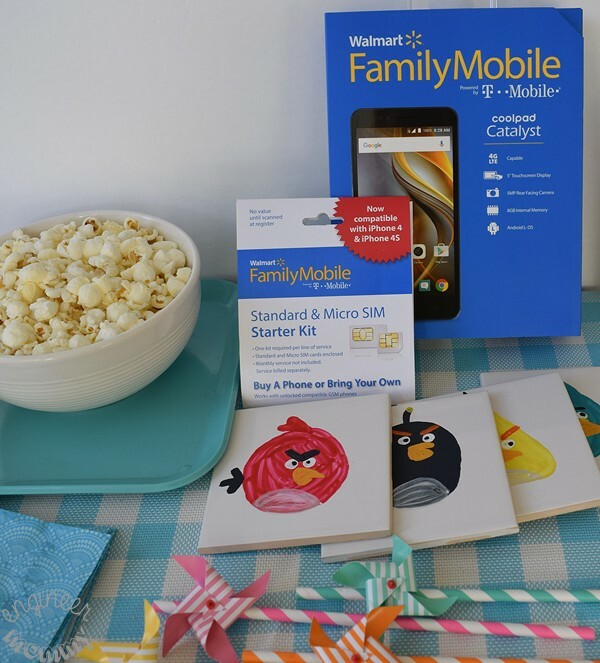 Now, learn more about how the Walmart Family Mobile PLUS plan will give you enough data to power your digital lifestyle and tell me: Have you ever watched Angry Birds movie? Would you like more cellular data? What would you do with all the extra data? 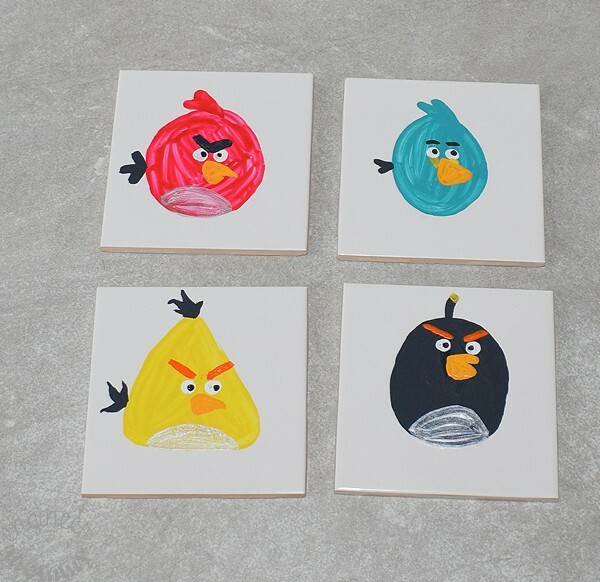 The Angry Bird tiles are so adorable! 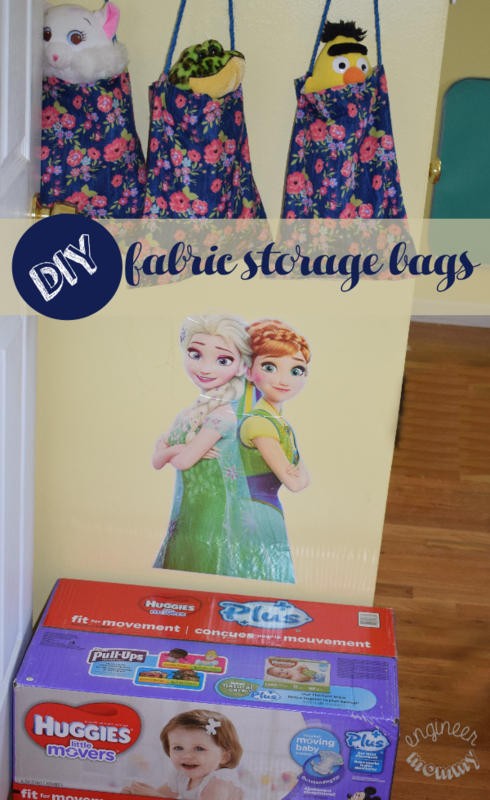 I know the grandkids would love making these the next time we have a slumber party at my house. I’m going to have to try this art project. The kids are going to love it! We still have not seen the movie so I’m glad it’s out on dvd now! So cute, you guys did a great job with the painting. Maybe I should allow my kids to do something like this. They would be so proud to hang up their work in their rooms. With these 100+ temps I’m on the hunt for indoor activities for our last week of summer. This phone plan looks like a great deal! Do you know if it’s available in Canada? I love the perk of a free movie, but besides that, it really does look like a great value for the phone plan! That is pretty cool! My son is a HUGE angry birds fan! We need to do this! He would love it! These are the cutest coasters! They came out awesome! I can’t wait to watch Angry Birds with my kids. Oh I love those cute coasters and the word search. This sounded like a really fun movie night. Oooo my daughter would love an angry birds movie night!!! I swear there isn’t a kiddo in the world not obsessed with angry birds! 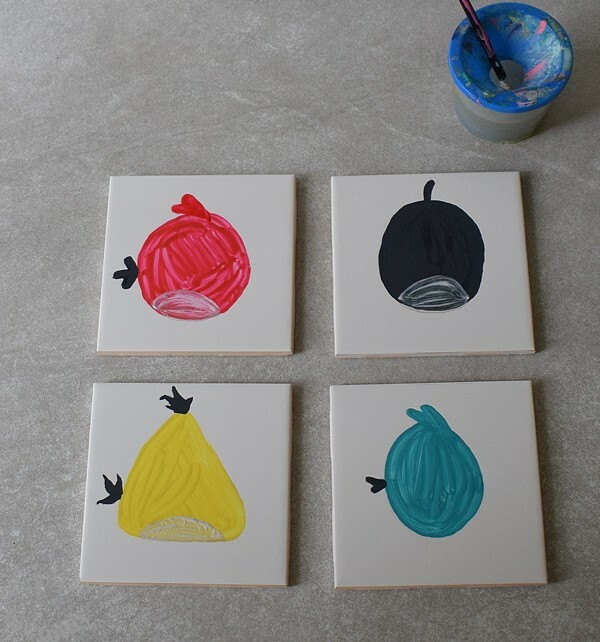 These coasters are too cute – they came out really nice. What a fun family movie night! These coasters are SO cute! My son LOVES Angry Birds! I can’t wait to watch it soon with him! What a really cute post! My little guy loves Angry Birds. The coasters idea is genious! Your movie night looks like it was so much fun! I would love to do something like this with my kids. This was a really cute movie night!! The coasters was really creative. 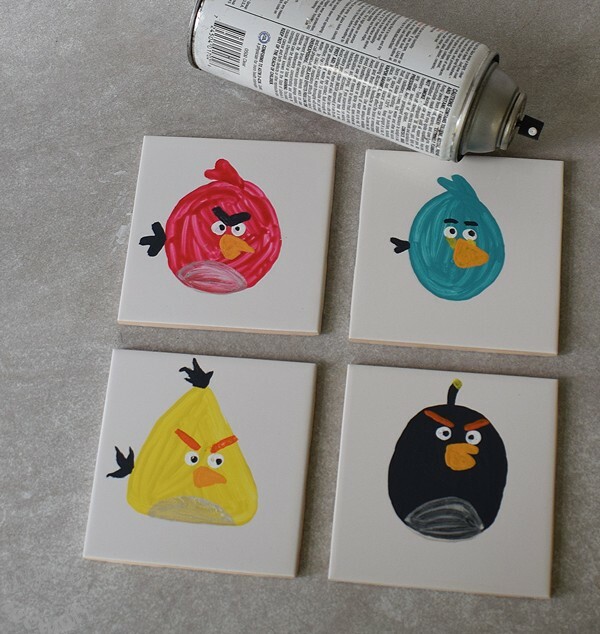 I’m loving these cute diy Angry Birds coasters a LOT! 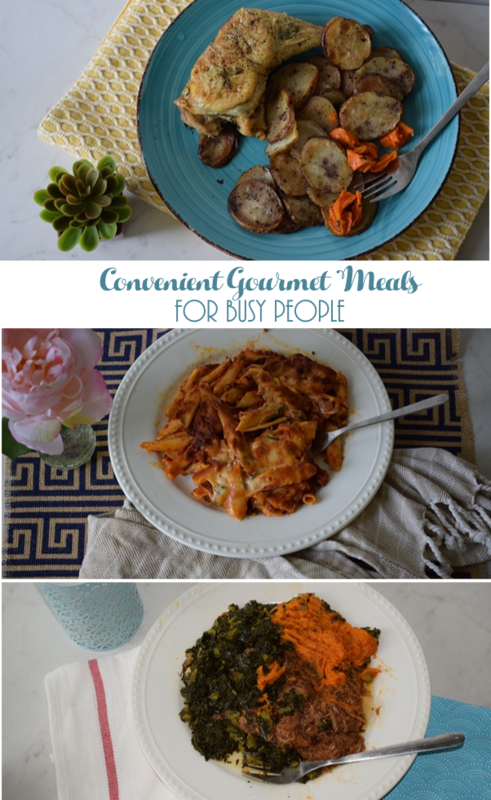 Looks simple enough to make too! We have never seen the Angry Birds movie, definitely need to check it out. If I had more data my kids would definitely watch more you tube videos.